The Kilbourne Post Office’s operations will be suspended at the close of business Friday, Aug. 18. Jessica Lilly, who has worked the window of the post office since November 2015, waits on Alison Vincent of Sunbury, who remembers the post office as little girl when visiting her grandmother. Kilbourne residents will no longer be able to avoid the lines at Delaware’s Post Office after Friday. The U.S. Postal Service will “suspend operations” of the Kilbourne location at the close of business on Aug. 18. 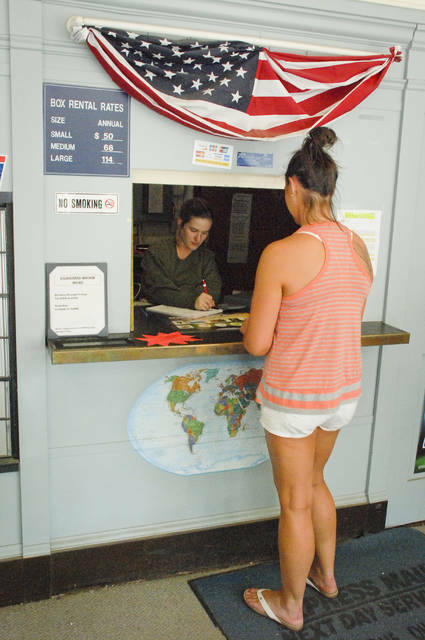 Stegner, a Kilbourne area native, said the post office has been a fixture there. “For 56 years there’s been a post office,” he said. Stegner said he’s been informed that residents aren’t getting the answers they need regarding how their addresses will change with the post office closing, which means an end to the familiar 43032 zip code. He said that Trustee Charles Miley has been working with the postal service and trustees have even offered the use of the old trustee building once the new one is finished. “The township is behind the residents 100 percent to help get what they need,” said Stegner. Jessica Lilly has only been at the little window of the Kilbourne Post Office since November 2015, but she has gotten to know the people in the rural community. “Residents said the post office has been trying to close this location for a while,” she said. There is no running water or restroom in the building, Lilly said. She said if she needs to use restroom facilities, she has to go across the street to the small store. “Safety is closing it immediately,” she said. Lilly said she has been told by older residents that the old building used to be the local grocery store, but the building has housed the post office for many years. Lilly said she was told by residents that the convenience was being able to avoid the Delaware Post Office lines and downtown traffic. “Holidays are pretty busy through here with people avoiding Delaware,” she said. Customers would come from Sunbury and Delaware, Lilly noted. She said the Delaware delivery starts at the curve of State Route 521 and Sunbury delivery begins when crossing the bridge over Alum Creek. Cathy Van Gundy said the closing doesn’t really bother her. Van Gundy said her only worry about the change of zip code is being sure she receives her mail from the Delaware office. This entry was tagged delaware, Delaware Ohio, Kilbourne, US Postal Service. Bookmark the permalink.